Imagine suspecting that your partner, the mother or father of your children, has a personality disorder — and then hearing that personality disorders are highly genetic. Imagine this person is your client. What do you do? This four-part webinar, Overcoming Genetic Risk for Externalizing Disorders, is designed to help you help your client. The webinars explains how childhood and adolescent externalizing disorders develop. You’ll learn about genetic risk. You’ll learn how environmental factors — from parenting to siblings to the child’s friends — interact with genetic endowment to promote or inhibit externalizing disorders. Most importantly, you’ll learn strategies that parents can use to help their children grow up healthy and happy, even if they were born with a risk for disorder. Diagnostic criteria for childhood externalizing disorders — including ADHD, oppositional defiant disorder, conduct disorder and substance use disorders. Results of genetic and family research studies about the heritability of adult antisocial, narcissistic and borderline personality disorders, and psychopathy. How parenting and other childhood experiences increase or decrease an at-risk child’s development of externalizing disorders. Best parenting strategies to counteract genetic traits children may have inherited that predispose them to developing externalizing disorders. Three core concepts of child development, and how to strengthen them so children can grow into healthy, productive adults. 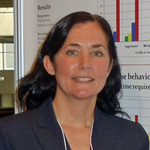 Liane J. Leedom, M.D., is a psychiatrist and an associate professor of counseling and psychology at the University of Bridgeport. She is author of Just Like His Father? A Guide to Overcoming Your Child’s Genetic Connection to Antisocial Behavior, Addiction and ADHD, and Women Who Love Psychopaths: Investigating the Relationships of Inevitable Harm. She is also author of multiple peer-reviewed studies, including The Problem of Parental Psychopathy, and Did He Ever Love Me? A Qualitative Study of Life with a Psychopathic Husband. In addition to her university research and teaching, Dr. Leedom is currently in private practice as a psychiatrist. She trained in medicine at the University of California, Los Angeles, and at the University of Southern California, Los Angeles. 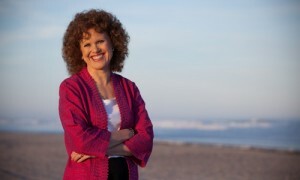 She previously served on the medical staff of several Connecticut facilities, including St. Vincent’s Medical Center, Hall-Brooke Behavioral Health Services, the Hospital of St. Raphael and the Center for Optimum Care. The cost for this course is only $90 for 4 hours of instruction. Once you purchase the course, you can view it as often as you want. There is no expiration date. This four-part series offers 4 hours of continuing education credit for mental health professionals. All 4 parts must be completed to receive credit. For more information on credits, click here. 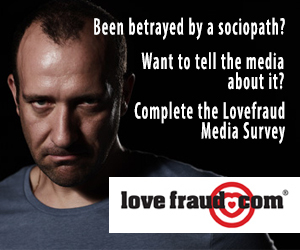 Mental health professionals who complete 8 Lovefraud CE credits are eligible for a free 12-month listing in the Lovefraud Professional Resources Guide. 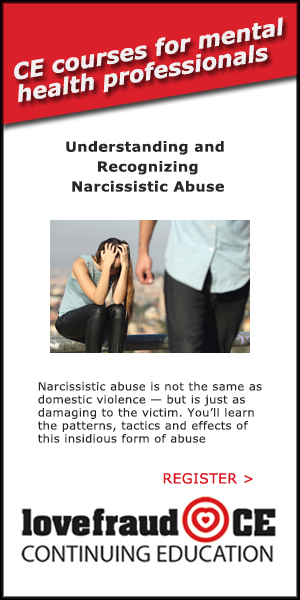 No commercial support was provided to Lovefraud Continuing Education or the instructor for this program. Name and describe externalizing disorders of childhood and adolescence, including attention deficit/hyperactivity disorder, conduct disorder, oppositional defiant disorder, and substance use disorders. Compare the diagnostic criteria for antisocial personality disorder and psychopathy. Describe human social behavioral systems and how they develop. Describe the impact of parental externalizing disorders on co-parents and children. Identify the risks to children of exposure to psychopathic parents. Explain the development of externalizing behavior in children and young adults. Discuss how to interpret the results of genetic studies. Describe the results of studies of genetic risk for externalizing disorders. Explain phenotypic traits and personality traits associated with externalizing disorders. Identify guidelines for talking to clients about genetic risk for externalizing disorders. Discuss environmental factors that influence the development of the externalizing phenotype in children and young adults. Explain the interaction between genetic and environmental effects in the development of externalizing disorders in children and young adults. Explain how parenting behavior influences the development of externalizing disorders in at-risk children and young adults. Discuss how genes affect the choices that at-risk children and young adults make in affiliating with peers, and how those choices impact the development of externalizing disorders. Assess environmental and genetic risk in at-risk children. Explain the two brain systems that mediate behavior. Discuss three methods that children use to learn from adults. Use three core child development concepts to explain the interaction between genetic and environmental risks for externalizing disorders. Describe how teen substance use enhances risk for future substance dependence. Summarize how to teach parents to mitigate the risk of a child developing an externalizing disorder. The accuracy and utility of the statements included in this presentation are based on referenced materials from reliable sources that are accessible and obtainable by all. The limitation of the content presented herein is that the results of execution have not been measured, therefore, expectation of outcome is not predictable. It is presumed that professionals executing the guidelines presented herein will apply such holding to the precise standards of their professional code of ethics, to reduce risk of ethical violations. As in all therapeutic interventions that may provoke emotional triggering, the professional may be required to perform risk assessment for suicidality, homicidality or other incident requiring emergency psychiatric services. Externalizing disorders in children, such as ADHD, oppositional defiant disorder, and conduct disorder, may be precursors to antisocial personality disorder and psychopathy as adults. 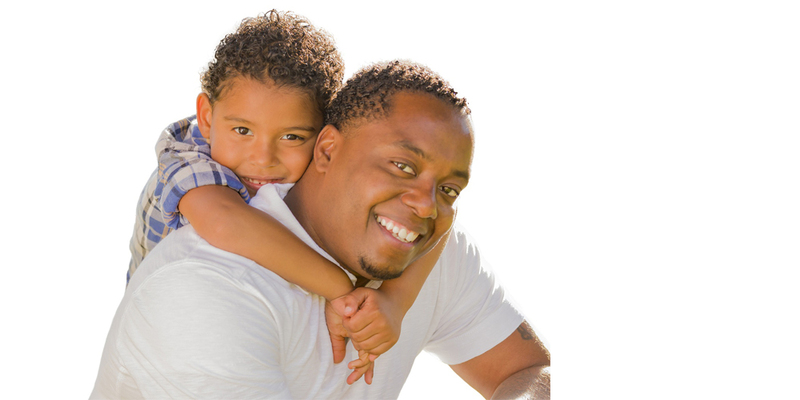 In this course, you’ll learn how to help parents help their at-risk children.